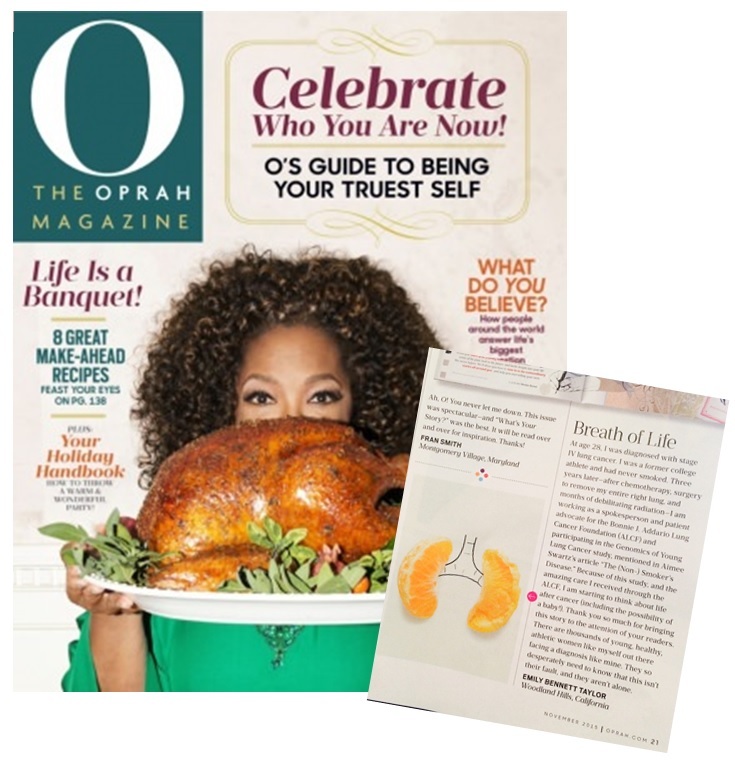 Many thanks to Oprah and the O Magazine staff for helping raise awareness of the growing prevalence of lung cancer among young never-smokers like myself, both through their informative article in last month’s issue and my follow-up letter in their November 2015 publication. See a copy of my letter below. Thanks, Oprah! Because of this study, and the amazing care I received through the ALCF, I am starting to think about life after cancer (including the possibility of a baby!). Thank you so much for bringing this story to the attention of your readers. There are thousands of young, healthy, athletic women like myself out there facing a diagnosis like mine. They so desperately need to know that this isn’t their fault, and they aren’t alone. This entry was posted in Uncategorized by EmBen Taylor. Bookmark the permalink. Emily…. I have had several friends call me after buying the magazine and asking if this was written by MY Emily. How exciting…..great job continuing to spread the important information. Hi sweetheart. Try to remember to say NEVER smoker….there are many non smokers which means they used to smoke but don’t now.